Our HIX Hobby 9” x 12” heat press allows your heat press to make your double sided projects such as t-shirt transfers easy to print. This is the Best hobby t-shirt press available on the market and perfect for the fashion student, business partner and artist. 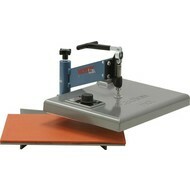 The lightweight and portable press is easy to carry and applies to all types of transfer paper.